Preheat oven to 200c / 400f / Gas Mark 6 / Aga – Roasting oven, third set of runners. To make the tomato sauce, soften the onion in the olive oil for about 5mins, add the garlic and continue to cook for 2-3 minutes. When really soft add the chopped tomatoes, tomato puree, sugar and seasoning. Stir, bring to the boil and allow to simmer until reduced by half. Liquidise and set aside. For the meatballs roughly chop the chorizo and then whizz in the magimix until it looks minced. Place the chorizo and sausagemeat into a large bowl with the egg, parmesan, and herbs. Season and mix together really well, then shape into meatballs the size of walnuts. Place in the fridge for 10-15mins to firm up and hold their shape. 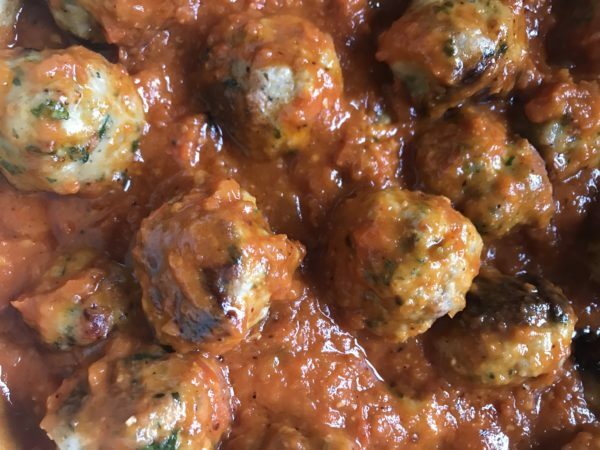 Heat some oil in a pan, brown off the meat balls in batches and place in an oven proof dish. Cover with the tomato sauce, tear the mozzarella and place on top of the sauce with the parmesan. Bake in the oven for 20-25 mins or until the cheese has melted and gone slightly golden.